The project can be divided in different aspects we will must focus on. This video explains how all the components work. There are explained the Neural Network, Genetic Algorithm, Camera and Cars. 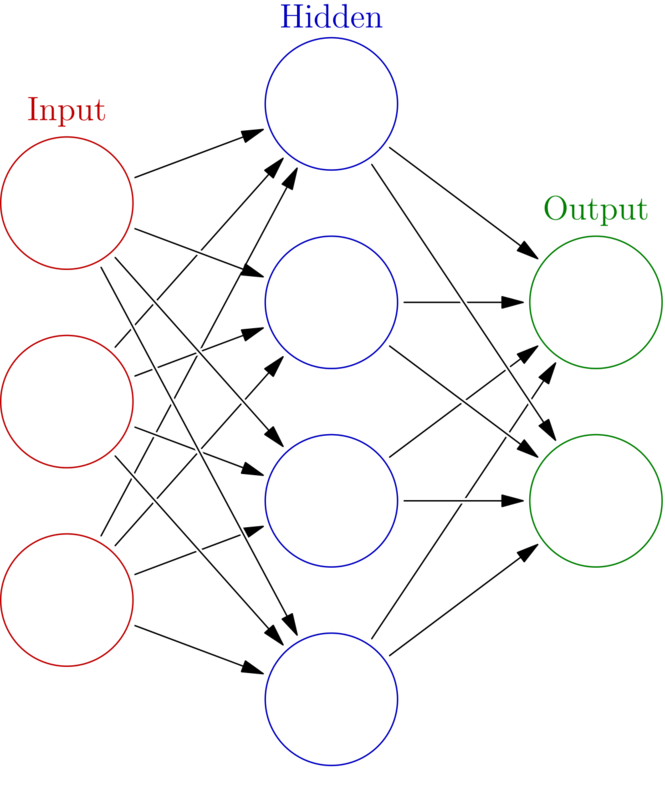 Neural Networks are computing systems that are used to relate different stimulus with different actions or possible solutions. A neural network is organized in layers and each layer will have a certain amount of neurons. This neurons will be connected to others with weights. Every neuron and weights will store a value. The weight values will be static when the network is being updated in our project. 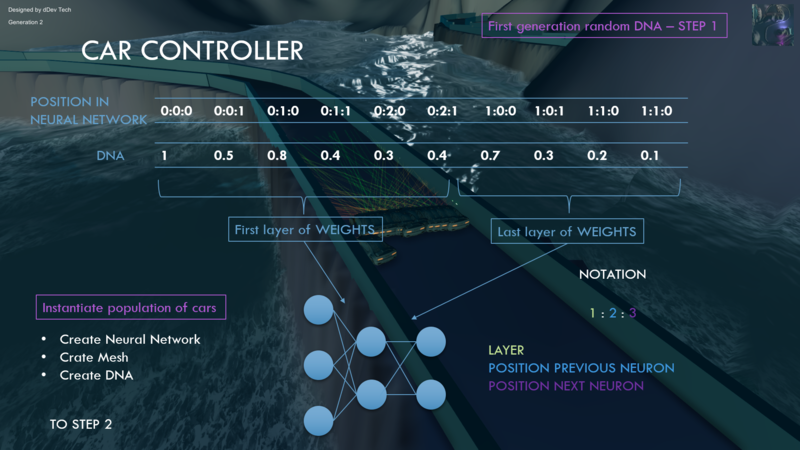 However, the neurons values will be changing during the simulator because they will depend on the input layer and the weights of the network. In out project each car will have its own neural network and it will be updated every time. This updated algorithm is called feed-forward. 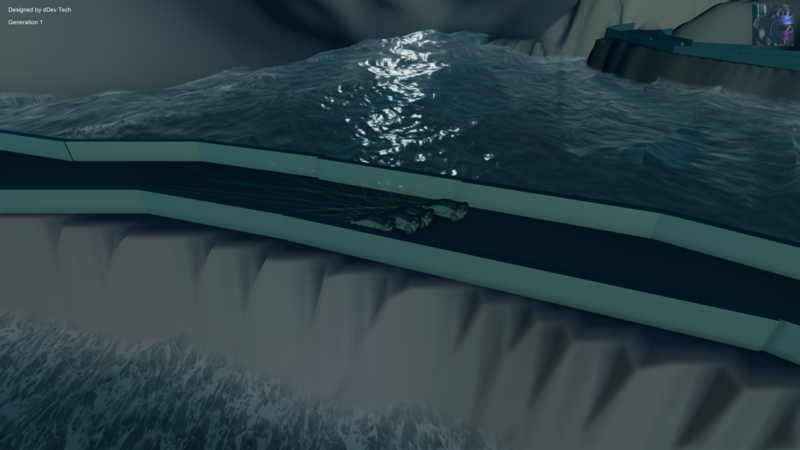 The cars will have as the input layer the distances to the walls that surround the cars. With this inputs and the weights we will get some ouputs that would be the rotation and the acceleration. We will be using the next formula for updating the network (feed-forward). We will apply this to every single neuron starting from the first layer to the last layer or outputs. 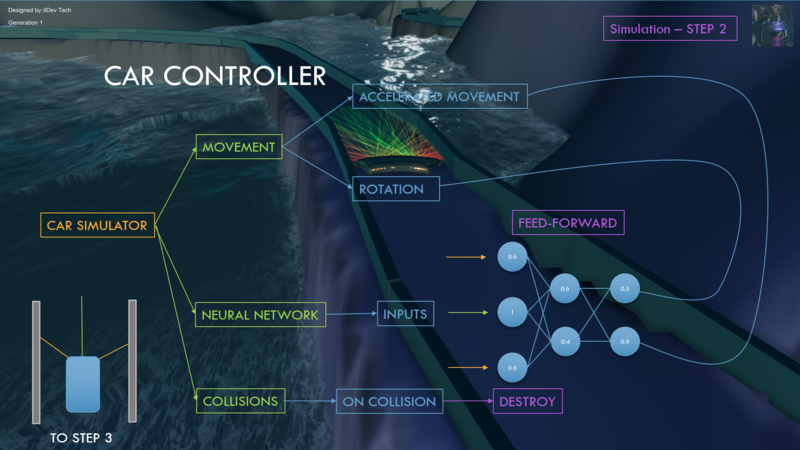 Instead of using backpropagation for the Neural Network to learn, we will be using reinforcement learning. We will use the Genetic Algorithm applied to every cars. As the Darwin's law says the entity (car) with the best genes will survive and it will propagate the genes to the next generation. They will evolve in a better way and survive more time. If we want to express this matematically for out cars we should then start by creating for each car is own list of genes. There will be as much genes as the quantity of weights in the neural network of each car. When we create the array we will start by creating it in a random way in the first generation. We will create different random DNAs for each car. Then we will assign this DNA to the weights of the Neural Networks of the cars. 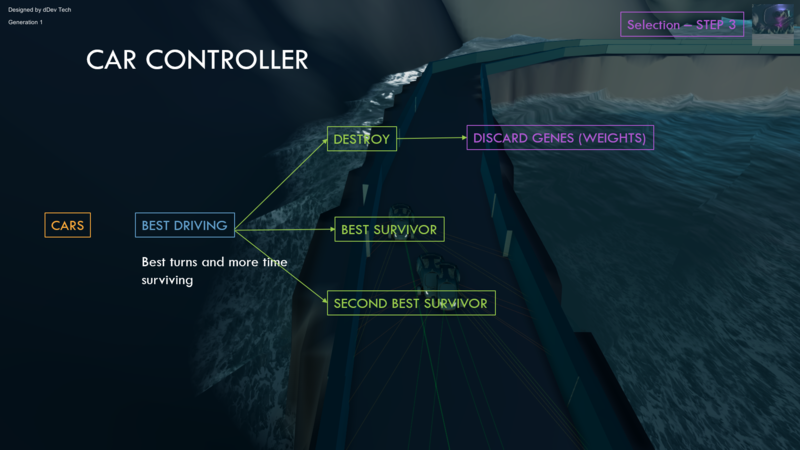 When the simulator finished because all the cars have collided with a wall, we should choose which have the best genes. You can do this in a lot of different ways. Depending on the distance traveled, the average speed or the time driving. I choosed for this project the time of the car driving, so we will ge the genes for the first and second car that survive more time in the track. All this factors could be joined to obtain a better selection of parents. It can depend also on the diversity we want to achieve. With the parents selected we will swap the genes to create a new DNA with a mix of both parents prefering random fragments from one parent and the other. This random value could be modificated depending if the parents have very different fitness or very similar. As they a similar fitness score they will have more similar probability to be chosen the genes. When we create for each new car for the new generation the mixture between both parents we will create different mutations. This is used because the parents are the best from the generation but not the best driving cars. We must create small mutations in the DNA of each new car to get better cars. However we could also get worse car but we will discard for the next generation. We will define a variable called initial mutation probability that will be how probable is any gen to be mutated. Also this probability will change in an inversily proportional way to the total fitness of all the cars. Additionaly from the algorithms, we should create all the mesh from the cars, terrain, effects, track and camera. Each car must be able to move and rotate. Each car will have its own lasers that raycast the distances to the track walls and output a value from 0 to 1. We will finally need to join and interact with all the stuff created before. 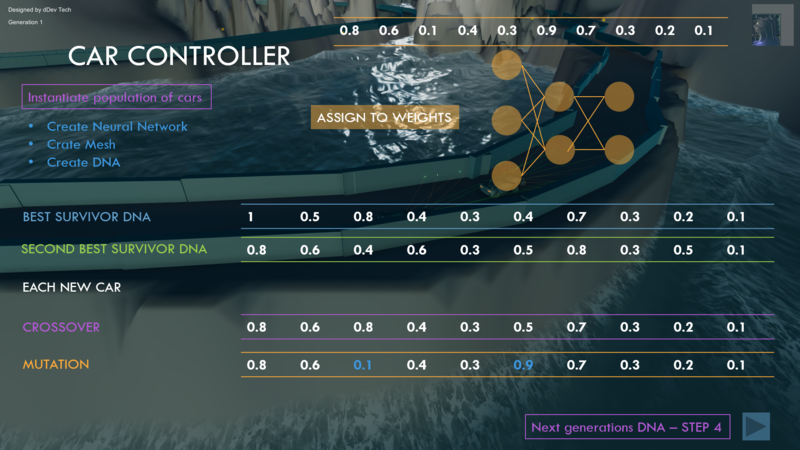 We will have a class called Controller that will be in charge of controlling every object and algorithm in the simulator. The lasers will be the inputs of the Neural Network and will be assigned to the input layer of each car with its own lasers. Then we will need to apply the feed-forward algorithm and get the outputs of the Neural Network. These outputs will be the rotation and acceleration of each car that will be used in the physics of the car. This sequence will be updated every time for every car. Any comments or doubts please go to the forum page and create a new topic asking a questions. Other users or even the author will answer you as soon as posible. You should have an account to create a new post.